Registration for the Choreography competition will take place from 10:00am-10:30am with the choreography competition starting at the conclusion of the morning dancing (approximately 11:00am). Choreography max of 1:30. If you haven't done so yet, please please email your choreography music to us before the weekend! Championship registration will take place from 11:30am-12:30pm with the Championship competition starting at the conclusion of the morning awards (approximately 12:30pm). Championship age groups will remain as listed on entry - 7 & Under 12, 12 & Under 14, 14 & Under 16, 16 & Under 18, 18 & Over. No concessions will be provided on-site, but we will have our annual raffle table & on-site vendors. Admission will be $5/person 12 & Under and limited programs will be available on-site for purchase for $5 each (USD only). Competition will be conducted in accordance with the rules of S.O.B.H.D. Age groups determined by entries, including Championship. The decision of the judge is final. Dance numbers will be provided at registration. Entrance fee to competition $5 per person (12 and over). Children under 12 enter free. No concessions will be provided. Contact QOSDA@hotmail.com with questions or visit www.QOSDA.com. Save $10 on each registration with Super Early Bird pricing by registering prior to April 20, 2018. Save $5/event on each registration with Early Bird pricing by registering prior to April 28, 2018! (discount accounted for in online pricing!). Entries closed May 5, 2018. 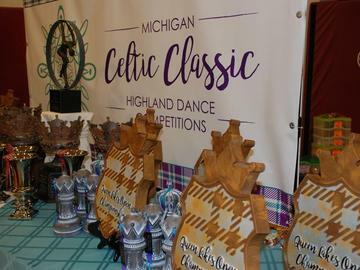 Host Hotel: Hampton Inn Shelby Township, 51620 Shelby Parkway, Shelby Township, MI 48315, (586) 731-4267 -- special discounted rate of only $109/night with code "Celtic Classic". Reservations must be made by April 18th to receive discounted rate.